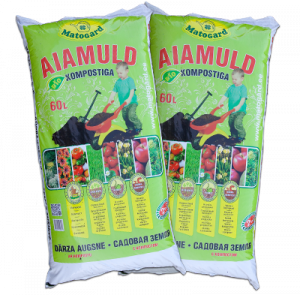 Ready for use, biologically active general soil for growing plants in your home garden. Using Matogard garden soil improves the biological characteristics of the growing soil for years. Peat – neutralised with dolomite flour and enriched with organic fertilizers. Horse manure compost – the garden soil contains floral nutritional compost biotechnologically made of horse manure. Ensures a suitable microbiological mix for plants. Organic fertilizers – natural fertilizers, which in combination with composts ensure the ratio of nutrients needed for growth of plants. Matogard garden soil with compost can be used in organic farming. The product meets the requirements of the regulation (EC) 834/2007. The nutrients provided with composts remain in the soil for a longer period of time and are tightly attached to soil particles. Mixing Matogard’s garden soil with your existing growing soil improves the biological and physical characteristics of the existing growing soil for years with the help of composts and microbiological preparations. Accelerates growth of plants, strengthens the roots and facilitates blooming. Improves the disease and stress resistance of plants. Clay and sand give the garden soil a consistent structure and create a beneficial humidity and air regime in the soil.